Head coach Steve Henson and the Roadrunners improve to 5-5 in conference play with a hard-fought win over the best offensive team in Conference USA. For Marshall, Thursday night's loss is the third in their last five games. The first-ever beIN SPORTS broadcast from the city of San Antonio did not disappoint. UTSA followed up their road upset of UAB on Saturday with a pressure-packed 81-77 home victory on Thursday night over Marshall - in a game that featured four lead changes in the last three minutes. The win gives the young, plucky Roadrunners their second win over a top-five Conference USA opponent in as many games. The story of the night for the Roadrunners was their ability to absolutely dominate The Herd in the rebounding department. UTSA out-rebounded Marshall by 19 on the night. The bulk of that difference came from their 20 to 4 advantage on the offensive glass. For a young team that struggled mightily from the free-throw line and never quite found the stroke from downtown, those second-chance opportunities would prove vital as the game wore on. Freshman sensation Jhivvan Jackson had a brutal start to the game but turned it around in a big way. The young guard went 0 for 6 from the field and had two turnovers in the first 10 minutes of the game. However, he shot 7 for 11 in the second half and finished with a game-high 23 points - including a fast-break layup in the final minute that pushed the Roadrunner lead to three. During Jackson’s first-half struggles, freshman Keaton Wallace and sophomore Giovanni Di Nicolao helped pick up the slack with timely buckets and solid defense on Marshall’s explosive guards. Di Nicolao scored 4 of the team’s first 6 baskets and finished with 10 points and 9 rebounds. Wallace finished with 12 points on 3 of 4 shooting from three. 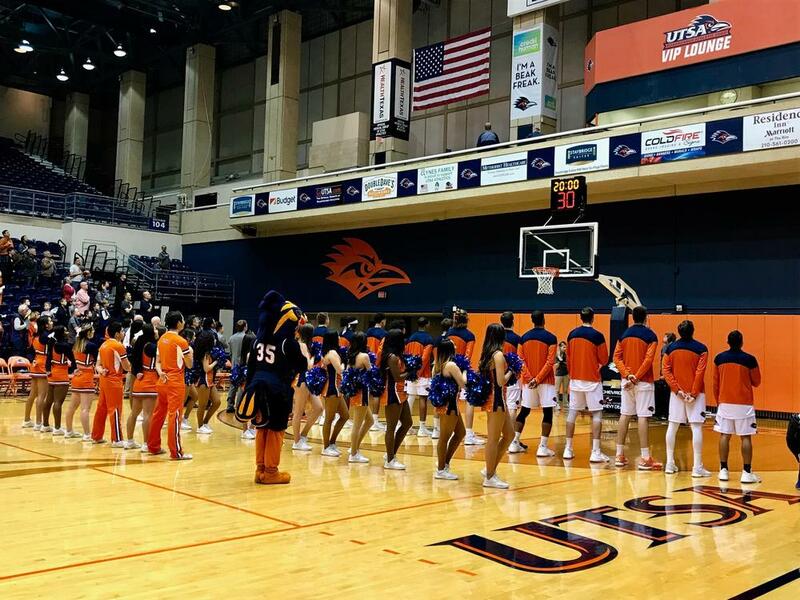 When the game looked like it was going to slip from the Roadrunners’ hands late, it was an all-important Keaton three that gave UTSA a 78-77 lead that it would keep for good. Sophomore forward Nick Allen deserves recognition as well. Allen shot 4 of 5 from the field in the second half - he finished with 13 points and 9 rebounds. Four of those came on the offensive end. Head coach Steve Henson and the rest of the Roadrunners should be proud of this all-around team victory over a tough conference opponent. All nine UTSA players that saw action on Thursday night scored. The Roadrunners face another tough test at home on Saturday against a Western Kentucky team that has won 9 out of its last 10 games. For Dan D’Antoni and the Thundering Herd, this is a disappointing result after a brave comeback bid from Penava and Elmore in the second half. The loss is Marshall’s second in a row and its third in the last five games. Beside getting plastered on the offensive boards, The Herd came out sloppy in both halves. Marshall gave up 4 turnovers in the first 4 minutes of the first half, then came back out with 5 more turnovers in the first 5 minutes of the second half. When you combine those turnovers with the rebounding disparity, UTSA took 18 more shots than Marshall. You can’t win like that - no matter how good you are. After shooting better than 50% from three in each of his last 5 outings, the red-hot C.J. Burks came crashing back down to Earth on Thursday night. He missed all 6 of his three-point attempts. For most players, a 16-point night is satisfactory, but for Burks, it’s his lowest scoring output in any conference game this season. Ajdin Penava put up his usual impressive stat line - 18 points, 8 rebounds, 4 blocks. However, his 6 turnovers from the forward spot proved costly. Jon Elmore was the single-piston engine that powered The Herd through most of the game. He finished with 23 points, pulled down a career-high 13 rebounds, and dished out 5 assists - including multiple alley-oop offerings to Penava. When Marshall took the lead in the final minutes, it was off of an Elmore show from downtown. But it wasn’t enough. For Marshall, there should be concern about overworking some of the players. Before the game, D’Antoni lamented the fact that Marshall hasn’t been with its full lineup for much of the year - which has resulted in some players logging too many minutes. Elmore and Penava played all 40 minutes on Thursday night, and all five starters logged more than 35 minutes. Only seven players saw the court for the Herd, which led to a 25 to 7 disadvantage in bench scoring. The Herd will head west to El Paso next to take on the UTEP Miners on Saturday. beIN SPORTS heads to Ruston, Louisiana next week. Tune in to watch the streaking Louisiana Tech Bulldogs (14-9 overall, 5-5 C-USA) host the Charlotte 49ers (5-15 overall, 1-8 C-USA) at 8:00 PM ET/ 7:00 PM CT.